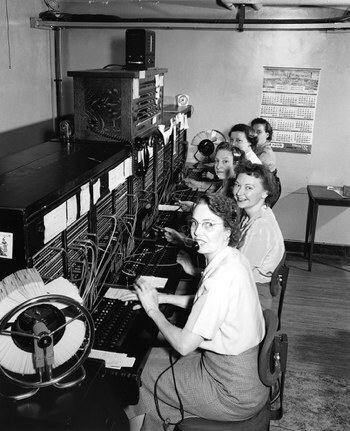 Today's medical alert monitoring call centers use more up-to-date equipment than these old fashioned telephone operators. A monitored medical alert system is a medical alert button and base station that call a professionally-staffed call center when the panic button is pushed. The big difference between a monitored system and a no-fee medical alert device is that when you press the button you get a live operator on the other end of the line. The live operator can talk with you through the base station. They can find out what’s wrong, and dispatch appropriate help. Sometimes this is as simple as calling your neighbor to have them come over to help you. Other times it might be that you need urgent help because you’ve fallen or gotten injured. In this case they can call the ambulance. Then they can also call a family member to notify them. With a monitored system, you need to focus on two areas. The first is the equipment provided by the service. As with no-fee medical alerts, the quality and the features of the equipment can vary. Each company’s website will help you understand the exact features and benefits of the unit they sell. The other area is the call center. Some call centers are staffed with paramedics or other trained professionals. Others are staffed with low-paid phone operators who might or might not be helpful in an emergency. This is an important area to investigate. In general, you want to find a company that is able to keep phone staff for many years, and you’ll want to know what kind of training they do. Another difference between different monitoring centers is the kind of services they expect to provide. Some monitoring services are only for emergencies. Others welcome check-in calls or non-emergency requests for assistance. Additionally, different companies will have different rules for what kind of information they give out to family members. One of the biggest advantages of a monitored setup, in my opinion, is that you have a live person who can determine the appropriate level of help. They can also communicate with other people: for example they can notify your family or tell the ambulance crew how to get access to the house without breaking windows. Learn about the different kinds of monitored medical alerts. I need instructions as how to set up the LIfe Alert to my computer line. For that you’ll need to talk to the folks at LifeAlert. Just as a side note, I’m not sure if it works on VOIP, if that’s what you mean by your computer line. Good luck! Life Alert does work with VOIP – such as Vonage. Just let a sales rep know this is they type of home phone line that you use. I like the idea of providing simple access to emergency help for anyone who needs it. I guess that’s where a 911-only medical alert would come in, but the good ones are well over $100. And putting handles or grab rails on tricky steps is a great way to prevent falls. Even with a medical alert, you don’t want a fall!